Does this, and other, similar forms of alternative, Eastern, Chinese, or complementary medicine help? Got a few days to discuss the issue, including the challenging consideration of whether chi really matters? 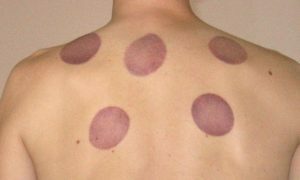 Healthnewsreview.org offers a good look at the media frenzy over cupping and the evidence about it. The New York Times, meantime, cites several studies on the benefits of cupping, published in peer-reviewed health and medical journals. But the experts quoted also emphasized that athletes may benefit most, not just from cupping, but the placebo effect−if they’re told repeatedly its good for them, and if they feel even a little bit better, their minds can exaggerate the treatment’s favorable outcomes. The Chinese, a third of the planet’s people, long have pursued theories and therapies in health and medicine that differ vastly from those in the West. Along with President Nixon’s opening of China, Americans were riveted years ago by New York Times columnist James Reston’s account of receiving what he termed beneficial acupuncture as part of an appendix surgery in Beijing. Scientific American recounted the impact of Reston’s account in popularizing acupuncture and other Eastern therapies, including cupping, in the West−and the thin scientific evidence to support this kind of care. The Chinese since, of course, have adopted widely Western medical advances; the West has prominent centers like the National Center for Complementary and Integrative Health, the lead federal agency for scientific research on complementary and integrative health approaches. California endorses acupuncture to the extent that it tests and licenses thousands of practitioners. But even as well-known a research- and evidence-based institution as the RAND Corp., when confronting the question of the validity of complementary or alternative medicine and what policies should apply to these, sort of ducked.